Privacy, peacefulness and plenty of sunshine. 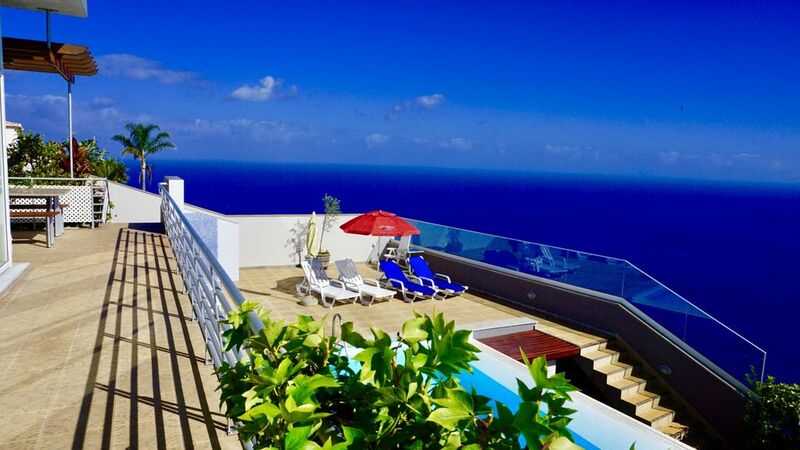 Our Villa in Madeira has an unobstructed Atlantic Ocean view. Self catering accommodation in Madeira of a very high standard, offered in twin or double rooms with en-suite bathrooms and sea-view balconies, private parking and swimming pool all for a relaxing holiday in Madeira. A great range of amenities within walking distance and our villa in Madeira, is just 20 mins away from the airport... you can relax as soon as you arrive to Madeira Island. Villa Babel is the ideal choice for those who prefer the calm and privacy of the pool to the noise and crowds of mass tourism. Whether a family or a large group our private villa will undoubtedly impress and satisfy the self-catering traveler who enjoys being in control of his holiday. Are we near local amenities? : Yes, the Garajau High Road is a short walk away and there you find a variety of small shops and quality, bars, cafes & restaurants supermarkets etc... all working till late to make your stay easy and more enjoyable. Are there public transports? : Yes, there is a hourly bus service to down town Funchal. The journey takes just over 30mns and the last service is a 11pm. There is also a Taxi service. Just ask for the contact number of one of our recommended taxi drivers. As in all self catering holidays, car hire makes it all the more comfortable and we may be able to get your a preferred rate from our recommended rent-car-car company. Just ask. All our rooms have en-suite facilities. There's a WC serving the lounge/dinning area. Both on site and street parking free. Games Room has a pool table and bar ( drinks not supplied ). There are sofas and a 50' TV. A small selection of CD's is available. We have some exotic fruits in the garden namely, Passion Fruit, Figs, Loquats, Goiaba Arassais & Pitangas but if there are no fruits left you can always find more in our Farmers Market down Town. All rooms have sea viewing balconies. Palheiro Golf is the nearest Golf Course ( about 15mns by car ). Perfect house to stay with family of 15 persons. First visit to Madeira: lovely! Landscape and climate are fine. This villa is in a great location not in the tourist area of funchal but only a short trip in the car .Local restaurants have great food at local prices not like funchal.the view from the villa is something money can't buy.the villa has many stairs as like mist on the island as it's a very hilly place..the villa is also clean and the owner stays on the top floor who is there for any information you need or help.we found Manuel very hospitable and welcoming. If we decide to make a return trip to maderia this will be where we stay. The pictures of this villa do not do it justice! It's an amazing villa with great facilities and lovely owners. Manuel and his wife were just the best hosts. We were initially apprehensive about the owners living on the top floor but we shouldn't of worried. They were on hand when required and incredibly helpful and nice. The rest of the time they were invisible and we never felt watched in any way. Having them there was a big plus point! As for the villa, it's all about the views,, worth every penny! It is very hilly around the villa and everywhere in madeira but it wasn't a big issue and all of the children and adults managed fine! Manuel can help sort out taxis if you require them. Funchal is 10 minutes or so from the villa and catching the bus at the top of the hill was easy. Loads to do and the kids loved the entire holiday. I would recommend having the pool heated, especially if you have kids. All in all a fantastic place and would definitely go back and a massive part of that is down to Manuel and his wife. effort all the more worthwhile. We shall be delighted to welcome you all back again. Very good, spacious accommodation reasonably priced. If you like Madeira and have a large group you really can't go wrong with this property. Madeira is a unique experience. It is not a beach holiday but I would go back. Weather is temperate for the latitude. Food and entertainment is reasonably priced. Being an Island I expected things to be more. We went with my family for my 60th birthday, there were 11 of us. We had a great time. Thoroughly recommend this vacation to anybody. Fantastic property, we will be back! We stayed in Villa Babel in August 2015. The villa was spacious and perfect for our family of 12. Very clean with all amenities nearby. Swimming pool was amazing and much enjoyed..children were particularly happy. We were also very lucky to spot a whale from our balcony! Special holiday indeed..we'll be back again and for a longer holiday! Thanks for having us. Situated in the Garajau overlooking the Atlantic Ocean and Funchal harbour, Villa Babel is only a short walk away from the High Road. There you can find a number of quality restaurants, bars & cafes with a good range of local gourmet awaiting to be explored. For seashore swimming just walk down the Garajau Beach just below 'Christ the King' statue; an amazing setting right in the heart of Garajau's Natural Reserve. We are only 10 mins by car to Funchal, the capital of Madeira. There you can take a dolphin & whale watching boat trip or simply treat yourself to a wine tasting visit to the Madeira Wine Cellars. To complement you holiday, visit the Reid's Hotel for an afternoon tea in the 'good-old' colonial style. For a good night's entertainment which includes dinner, drinks and a truly professional show try the Pestana Casino in Funchal. Locally in Garajau there is entertainment nightly in the Don Pedro Hotel. Otherwise, just bring your favorite music and relax in our ample lounge. Golf: Golfers will be pleased to know that the 18-hole Palheiro golf course is no more than a 10minute drive. Classic Madeiran hills, ridges and deep valleys have all been incorporated into the terrain to produce a dramatically interesting course, with stunning views over the Funchal Bay.